but we're more alike than you think. Together, we are keeping something alive - something that has lived for thousands of years despite the wavering faith of mortal men. The old gods are not dead. They live within us. We give them life, warm blood, and they keep us from death. That's our covenant, our promise. Everything else is fashion." 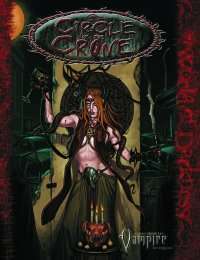 Circle of the Crone is a supplement for Vampire: The Requiem. For use with the World of Darkness Rulebook.